Yesterday I told you all about my grand plans for an early Christmas victory. 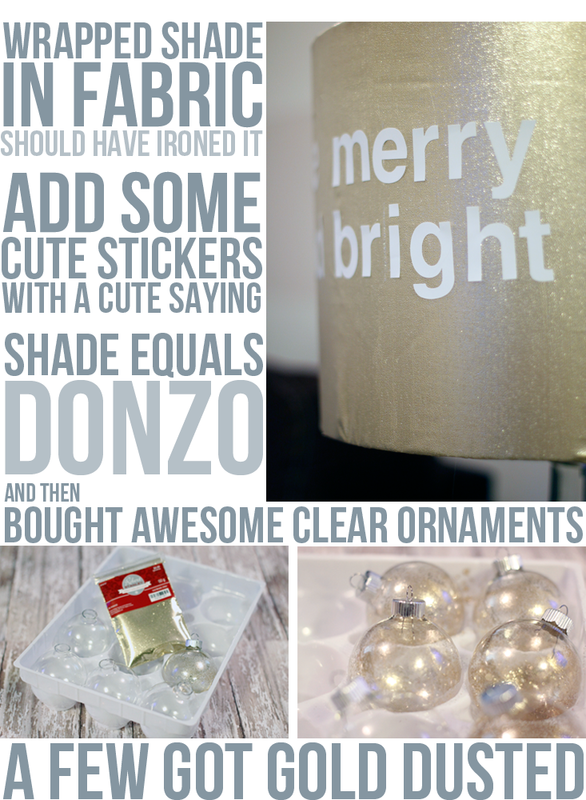 I also revealed my excitement that Lamps Plus and Hometalk got together, gathered some bloggers and gave them each a fillable lamp to make their own. There is nothing I love more than a crafting challenge, except maybe procrastinating….which explains why last night I spent the whole night try to be creative on the spot thanks to that first fail. I knew I was heading in the gold direction. There is no better time to mix metallics than during the holidays, so I embraced it a little early. When I found some pretty gold fabric I knew that had to be the shade cover. Unfortunately, since I am not a professional photographer I had a lot of trouble showing you how pretty this fabric really is. I wanted to avoid anything predictable for the base, but guess what I fell in love with….the definition of predictable. Throw a quirky quote in and I am sold. I know it looks a little plain in that picture up there, but that’s because you can’t see all the glamour of that fabric. 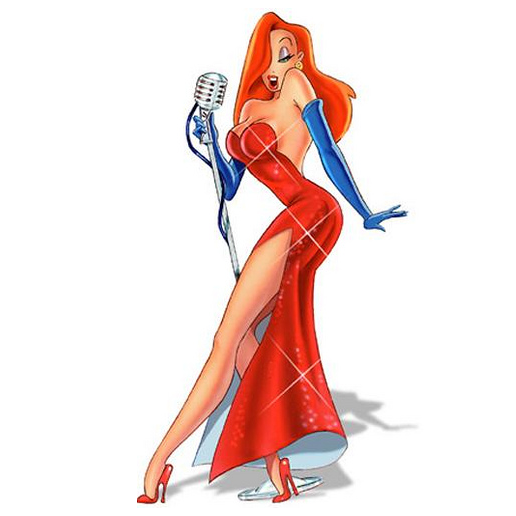 In person, it’s like Jessica Rabbit walking straight through my living room. You know it’s all about the details anyways. 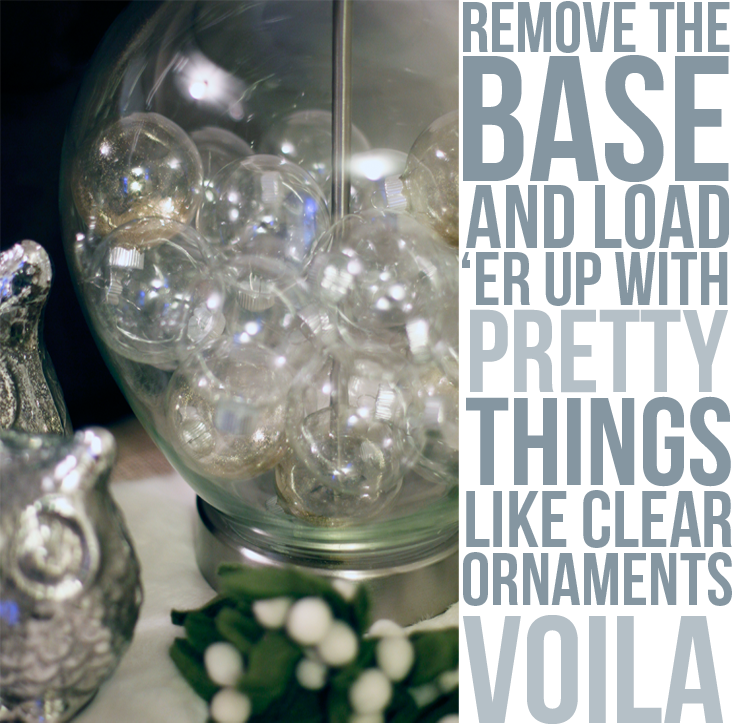 I fell hard for the clear ornaments, and ate my words on not wanting to use them. I just love how they reflect the light and sometimes look like bubbles in the lamp. I think I will keep them forever. The gold glitter adds that extra something, the oomph to my oh la la. The best part is, I can change out the base any dang time I want. 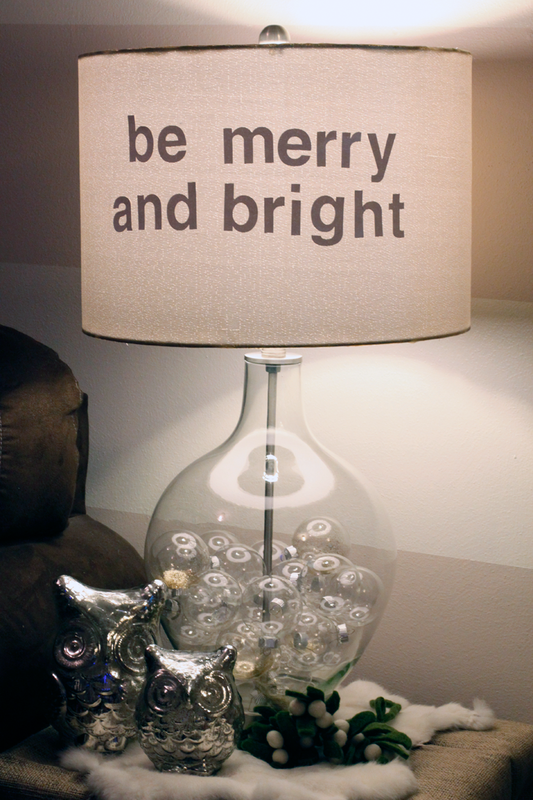 This is my kind of ever-lovin-mind-changing lamp. Maybe one day I will figure out the sand, one day. Do you think I made a good rebound from yesterday’s fail? Did you get my “bright” joke? What would you have filled this lamp with? Hmmm, not having the lamp in front of me, I’m wondering… could you glue the people to the base (maybe on a piece of foam to lift them up) then reassemble the lamp and seal the bottom hole with a caulk-like substance…then pour the sand in through the top and gently shake into place? Sooooo PRETTY! It looks like bubbles! I love the lamp! Very creative.